This week, Your News to Know brings you the latest stories involving gold and the overall economy. Stories include: Major gold fund sees a bull run in the yellow metal, gold is soaring again, and China’s gold imports seen jumping 50% as safe haven demand booms. Addressing Americans through their annual In Gold We Trust report, the managers at Incrementum AG spoke against the trend of piling into equities to net a quick profit. The analysts believe that risk-happy investors are ignoring both the likelihood of a recession and the potential for the U.S. economy to fall into a stagflation scenario, where growth slows but inflation rises. “Low interest rates combined with the pressure to invest and [Fear of Missing Out], have nurtured a treacherous sense of carelessness within many market participants. Scenarios such as significantly higher inflation or a recession are currently treated like black swans, although history shows that these events do occur at regular intervals,” said authors Ronald-Peter Stoeferle and Mark Valek. 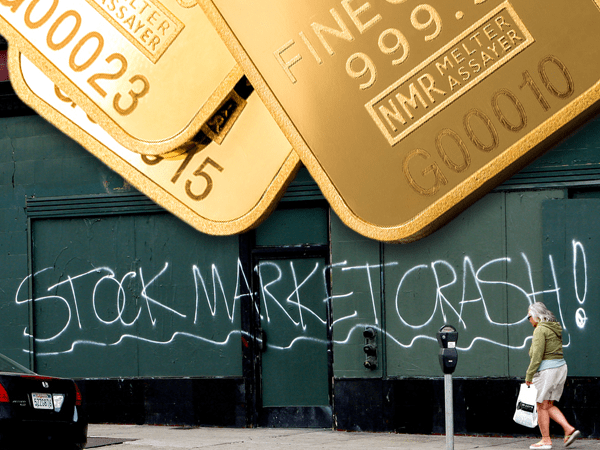 Noting that the rising stock market has been keeping gold down over the past couple of years, Stoeferle and Valek believe the metal’s time has finally come. “After almost five years of under-performance relative to the broad equity market, the tables might slowly be turning now in favor of gold,” they said. The authors believe that gold’s performance against the soaring stock market is the most telling sign of its future; not only has the metal gained more than 10% since the start of the year amid a record-high stock market, it also posted gains against a U.S. dollar that hit a 14-year high. “We regard this as a remarkable development and as a prime example of a bull market, whose starting gun has not been heard yet by the majority of investors,” said the firm. Outlining four possible economic scenarios for the U.S., Incrementum AG said that these two are the most likely: (1) growth and inflation both rise more than 3%, which would translate to gold prices trading between $1,400 and $2,300 an ounce, and (2) the U.S. economy falls into a recession or sees low growth and high inflation, leading to gold prices rising between $1,800 and $5,000 an ounce. “We assign the highest probability to the latter two scenarios. Similar to the 1930s and the 1970s, these scenarios would be difficult to navigate, but at the same time provide quite interesting investment opportunities,” said the firm, listing a rise to $2,300 an ounce by 2018 as its prediction for the metal. Gold shines in times of turmoil, and there has been no shortage of concerning events in recent times. The situation with Qatar, the latest terror attacks in London, the U.K. election and last week’s testimony by former FBI director James Comey are all helping lift gold prices. The ongoing feud between Qatar and other Middle Eastern nations could prove to be the most significant of these factors – several nations in the region have already cut diplomatic ties with Qatar amid accusations that the country sponsors terrorism. According to Ding Yao, an analyst with ThinkMarkets in London, “the conflict between Saudi Arabia and Qatar could change the shape of the Middle East” and push gold to $1,350 an ounce. A decline in the dollar has also helped gold post its gains, as did a slip in long-term Treasury bond yields. This year’s spike in gold prices could be a sign that people are worried about the U.S. economy, a notion supported by a weak jobs report released earlier this month. Rising consumer debt, which is already above 2008 levels, is another point of concern. “Investors are hedging their bets to some degree. There are some potential negative surprises lurking,” said Lisa Kopp, head of traditional investments at U.S. Bank’s Private Client Reserve. The latest report by Incrementum said that worries about a sluggish economy will combine with a volatile political landscape in Washington to push gold even higher. “The rally in the precious metals sector has probably only just begun,” said the analysts, adding that “the election of probably the most unpredictable U.S. president of all time” is another boon for the metal. Bloomberg reports that China may soon boost imports through Hong Kong by 50% as people show an increase in safe haven demand amid currency risks, a slowing property market and volatile stocks. Haywood Cheung, president of the century-old Chinese Gold & Silver Exchange Society, said that mainland China is set to import about 1,000 metric tons from the territory in 2017. These numbers mark the highest import levels since 2013 and are a definitive upgrade from last year’s net purchases of 647 tons. Data from the China Gold Association shows that local consumption was up by 15% in the first quarter, with sales of bars for investment climbing more than 60%. China’s imports from Switzerland also rose to 442 tons last year, up from up from 288 tons in 2015. Cheung’s exchange is planning to build a bonded warehouse in Qianhai, which could store up to 1,500 tons of gold and is expected to complete in two to three years, with a temporary warehouse with a capacity of 50 to 100 tons of gold going live by the end of the year. While the society already has an offshore gold product with daily transactions of 20 to 30 billion yuan, the warehouse will provide means to get in touch with the China market, particularly the Shenzhen region which supports some 3,000 jewelry manufacturing companies that supply 70% of the Chinese retail market.